(Francisco Kjolseth | The Salt Lake Tribune) Poll worker Annabel Garcia puts up signs to direct people who arrive to vote at the Salt Lake County complex for primary election day on Tuesday, June 26, 2018. Washington • Three weeks before critical midterm elections, voters are expressing significantly more interest in turning out than they were four years ago, according to a Washington Post-ABC News poll. 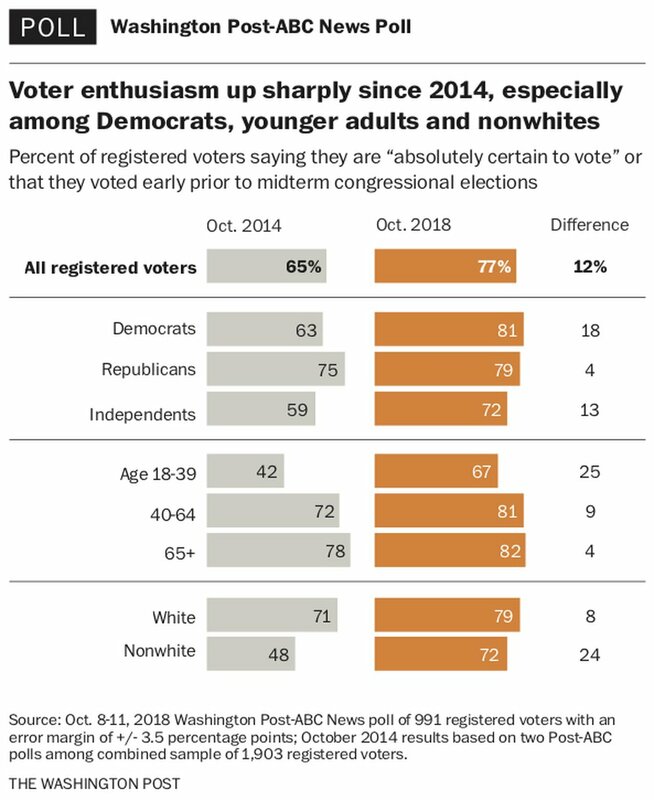 Enthusiasm is up across almost all demographic groups, but the increases are greater among younger adults, nonwhite voters and those who say they favor Democrats for the House. At the same time, President Donald Trump's job approval rating has risen five points after tying a record low point in August, although Democrats maintain a double-digit advantage in overall support for Congress, the poll finds. Four years ago, midterm voter turnout fell to its lowest level in more than half a century. Republicans were able to capitalize by expanding their House majority and taking control of the Senate. Today, with that GOP House majority at risk and some close Senate races that will determine who has control of that chamber in January, a 77 percent majority of registered voters say they are certain to vote next month or have already voted, up from a 65 percent majority in Post-ABC polls in October 2014. (The Washington Post) Three weeks before critical 2018 midterm elections, voters are expressing significantly more interest in turning out than they were four years ago. Certainty to vote is up 32 points among women younger than 40, compared with 2014. Among men and women ages 18 to 29, it has risen 17 points. Among nonwhite registered voters, 72 percent are now certain to vote, up from 48 percent in Post-ABC polling in October 2014. White men without college degrees represent the one heavily Republican group whose certainty to vote is lower than average and has increased less than other groups since 2014. In contrast, white women with college degrees are up 15 points to 88 percent. For white women without degrees, the figure is up 12 points. Among voters who prefer Democratic candidates for the House, 81 percent say they are certain to vote, up from 60 percent in 2014. Among those who support Republican candidates for the House, enthusiasm now stands at 76 percent, compared with 73 percent in October 2014. The poll offers no definitive answer to the question of how the partisan battle over the confirmation of Supreme Court Justice Brett M. Kavanaugh has affected intensity among voters from both parties. By one measure, the percentage of Republican voters who say they are now certain to vote has risen slightly more than among Democrats since August. By another, the Democrats' advantage from before the Kavanaugh fight remains. Asked directly, 33 percent of registered voters said the debate over Kavanaugh made them more likely to support Democrats while 27 percent said they are more apt to back Republicans, with a 39 percent plurality saying it makes no difference. While national effects are mixed, Republicans' overwhelming support for Trump's nominee may be a liability for Democratic senators running for reelection in heavily Republican states, including West Virginia and North Dakota. Registered voters say they prefer the Democratic candidate for the House over the Republican candidate by 11 percentage points — 53 percent to 42 percent. That is slightly lower than in August, when the Democratic advantage was 14 points. Among likely voters in the new survey, the margin is 13 points. Historically, that kind of gap foreshadows gains, possibly substantial, for the Democrats. The gender gap remains large, as it has all year. Among registered voters, women favor Democratic House candidates by 59 percent to 37 percent while men split about evenly, with 48 percent favoring Republican House candidates and 46 percent favoring Democrats. Those registered voters who describe themselves as independents favor Democrats by 52 percent to 38 percent, driven primarily by a 2-to-1 advantage for Democrats among independent women (62 percent to 29 percent). 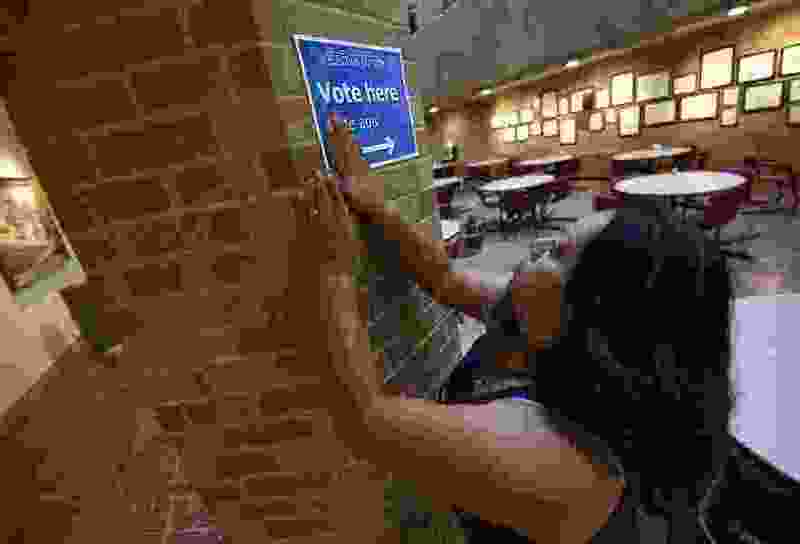 White women with college degrees split 57 percent to 42 percent for Democratic candidates while white women without a college education lean toward Republicans, 49 percent to 43 percent. The upward move in the president's approval rating brought it to 41 percent, with 54 percent disapproving, among adults overall. Among both registered voters and likely voters in the survey, his approval rating stood at 43 percent. Approval of his handling of the economy stands at 49 percent, with 46 percent disapproving. This is the first time Trump has received net positive ratings on the economy in Post-ABC polls. That increase in overall approval has not translated into similar Republican gains on the generic ballot because a record 90 percent of those who say they disapprove of the president now say they are supporting Democratic House candidates, up from 83 percent in August. Among those who approve of the president’s job performance, 87 percent support GOP House candidates — also a high in Post-ABC polling this election cycle. Historically, there is a close correlation between approval or disapproval of a sitting president and voting intentions in midterm elections, which is one reason Republicans have been eager all year to see the president's approval ratings increase. Majorities of voters see the upcoming elections as more important than in the past, with Democrats more likely to say so than Republicans. By 74 percent to 61 percent, registered voters who identify as Democrats or lean toward the Democratic Party are more likely than registered voters who identify as Republicans or lean toward the GOP to say these midterm elections are more important than past ones. The share of voters who say they prefer the next Congress to be in Democratic hands as a way of providing a check on Trump has fallen from 60 percent in August to 54 percent today, while the percentage who say they want a Congress controlled by Republicans to help support the president's agenda has risen from 34 percent to 41 percent.The current levels are similar to opinions of then-President Barack Obama ahead of the 2010 and 2014 midterms. Democrats suffered losses in both those elections. Majorities of Democrats and Republicans say supporting a candidate who shares their view of Trump is an important consideration in their vote. Overall, 58 percent of voters say this is "extremely" or "very" important, including 63 percent of Democrats and those who lean Democratic and 56 percent of Republicans and those who lean Republican. Among all adults, Democrats are trusted more than Republicans to deal with the main problems facing the nation, by 45 percent to 37 percent. Four years ago, adults split 39 percent to 39 percent on that question. In 2006, when Democrats swept to power in the House, their advantage on this question was 19 points. Of six individual issues, Democrats hold marginal to significant leads on five of them while Republicans hold a narrow advantage on one — the economy, by 45 percent to 41 percent. Democrats are rated insignificantly better on taxes (45 percent to 42 percent). Democratic advantages on the others are all by double digits. They lead by 10 points on which party is trusted more to change the way things are working in Washington; by 11 points on the appointment of judges to the Supreme Court; by 12 points on immigration; and by 26 points on who is trusted to handle equal treatment of men and women. The economy and health care rank as the most important voting issues this fall, followed by changing the way things work in Washington and the equal treatment of women and men, followed by taxes, immigration and the appointment of judges to the high court. The Washington Post-ABC News poll was conducted Monday through Thursday by telephone among a random national sample of 1,144 adults, with 65 percent reached on cellphones and 35 percent on landlines. The margin of sampling error is 3.5 points for overall results as well as for results among 991 registered voters; the error margin is four points among for the sample of 752 likely voters.